The Association of Polytheist Traditions [APT] is a non-profit organisation based in the UK. Most of us practise Reconstructed European Pagan Religions. But we welcome all polytheists, including those who adhere to 'world religions' and those who simply have personal relationships with individual gods. Click banner above for poster and directions. 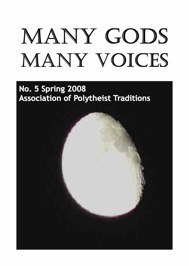 The Association of Polytheist Traditions has an announcement for all RENEWING and NEW MEMBERS for the year May 2008-2009. Last year 2007-08 - we know that we didn't do that much. Really we know. Personal circumstances intervened for so many people that it wasn't funny at all... This year, we've started with a fantastic Mini-Conference in Birmingham on Gods and Ancestors in the Landscape, then held another Mini-Conference in Glasgow on relationship beween humans, dieities and landscapes, including practices of seiðr and are holding more events around Britain. So here's an offer. This year's membership is on us. Membership of the APT is free until 31st May 2009 - whether you are renewing or joining fresh. However you have to tell us through our joining form, sending it to us electronically or by snail mail (obviously omitting the cheque) and make sure we have your current address and email. Recently, we've been at events in Derry, 16-20 June (SIEF folklore conference), Peterborough, 9th August (Heathenfest), Ipswich (Pookaspageant - Storytelling day - Aug 30th), and our own Glasgow miniconference in November (mini-conference on Deities and Ancestors, and how we meet them). Manchester in late winter/early spring. More are in planning and we'd value your input and your voices. Please contact our Speaker email via the APT website if you will be at or near any of these events, so that we can meet up. The best way to reach us is via our website at http://www.manygods.org.uk, with our magazine at http://www.manygods.org.uk/MGMV/. The first magazine issue is a free download from the website, others are for members only. And if you join, you get back numbers free, as long as we still have them in stock! Slainte, Waes hal, Ave, Cheers and all good wishes. To increase awareness of polytheism within the pagan community, the interfaith community and amongst the wider public. To act as a networking/social organisation, helping to establish local polytheist groups and national gatherings. What Do We Mean by Polytheist? We recognise many gods and do not deny the existence of gods from religions other than our own. We see our gods as individual deities, not as 'aspects of the Divine' nor as 'avatars of the Godhead'. We see our gods as having independent existences outside of our own psyches rather than being unconscious archetypes. Our gods may appear to us as male, female, or of no fixed gender. If you consider yourself a polytheist, and agree with the statements above, why not join us? You can learn here about our magazine, Many Gods, Many Voices. Issue 1 is online as a free download to all, and Issue 2 will shortly be again available online for members. Issues 3, 4 and 5 have been sent to members in hard copy. To learn more about polytheism and polytheist religions, visit our articles page. To hear more about our recent events, visit our conferences and events page.